"Terese Svoboda is one of those writers you would be tempted to read regardless of the setting or the period or the plot or even the genre.”--Bloomsbury Review. 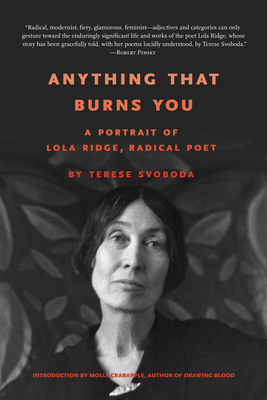 Along with Anything That Burns You: A Portrait of Lola Ridge, A Radical Poet, Terese Svoboda has published 6 books of fiction, 7 books of poetry, a memoir, and a book of translation from the Sudanese. Winner of a Guggenheim, a Bobst Prize in fiction, an Iowa Prize for poetry, a NEH grant for translation, an O. Henry Award for the short story, the Graywolf Nonfiction Prize, 3 NYFA fellowships, a Pushcart Prize for the essay, a Bellagio Fellowship for libretto, and the Jerome Foundation Award in video, she also wrote the libretto for the opera WET that premiered at L.A.'s RedCat Theater. Ajay Singh Chaudhary is the founding and current executive director of the Brooklyn Institute for Social Research. He holds a Ph.D. from Columbia University’s Institute for Comparative Literature and Society through the MESAAS department specializing in comparative philosophy, an M.Sc. in Culture and Society from the London School of Economics, an M.A. and M.Phil in Middle Eastern Studies from Columbia University. His research focuses on comparative philosophy, social and political theory, Frankfurt School critical theory, religion, political economy, media studies, and post-colonial studies. He has written for the Los Angeles Review of Books, Quartz, Social Text, Dialectical Anthropology, The Jewish Daily Forward, Filmmaker Magazine, 3quarksdaily, among other venues.